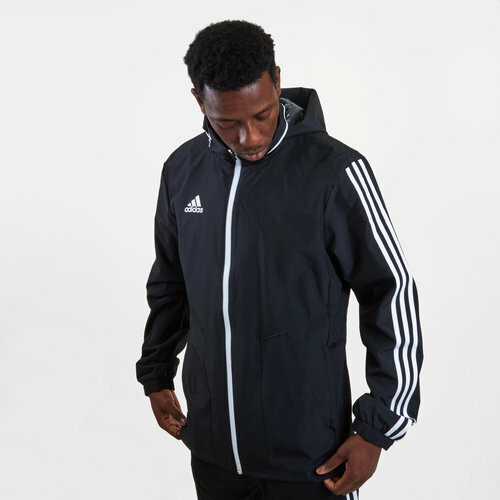 There's no reason why you can't train to your highest standard in this adidas Tiro 19 All-Weather Jacket that comes in a Black colourway. make sure you train hard whilst remaining comfortable with this jacket from adidas. When the rain hits or the wind is doing its best to push you back stand strong and train well as this coat will keep you covered. This is built for hard training sessions and has been crafted with a water-repellent layer that has been made with ventilation on the back. This jacket comes with a packable hood and zip pockets for storing valuables as well as keeping your hands warm.